is not surprising, I guess, since nearly 17% of the U. S. population claims to be of German descent. Many of our “typical American foods,” in fact, (such as hot dogs, hamburgers, and potato salad) have roots in the land of those ancestors. 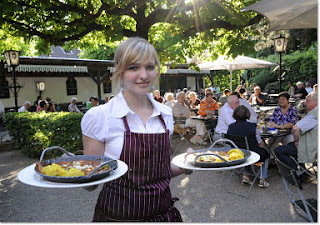 Our trips to different parts of Germany over the years have exposed us to regional specialties and have given us a real appreciation for their cuisine. variety of meats offered. There were wurst (sausage), salami, bacon, and ham, as well as eggs, cheese, fruit, bread, juice, and coffee. 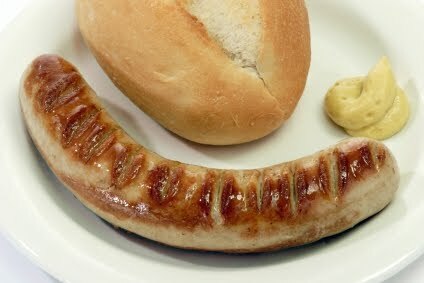 Wurst, which comes in as many as 1500 varieties according to some estimates, is available throughout the day and is omnipresent—anywhere from outdoor food stalls to nice restaurants. Currywurst, served with curried ketchup, was created in Berlin after the second world war; Thüringer bratwurst, a popular big white spicy sausage on a small bun, originated near Erfurt over 700 years ago. 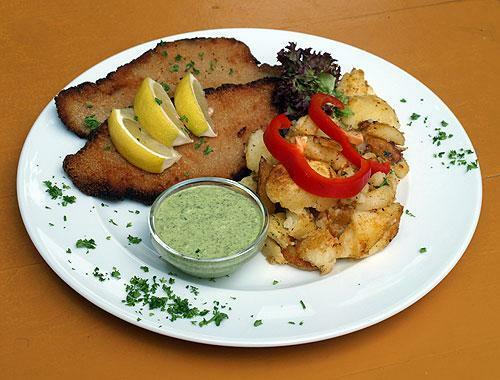 One classic main dish, Schnitzel, is thought to be an import from Austria. It can be made with thinly sliced veal, Wienerschnitzel (“Viennese cutlet”), or with pork, Schweineschnitzel, and is often served with French fries. Another variation, Jägerschnitzel (“Hunter’s cutlet”), comes with a mushroom cream sauce. Whatever the variant, it’s very easy to make: Put salt and pepper on a thin cutlet, dip in flour, raw eggs beaten with a little water and then fine bread crumbs, and pan fry. Serve with lemon wedges. We had schnitzel several times on our latest visit and loved the grüne sosse in Frankfurt, a creamy green herb sauce, which was apparently great German author Goethe’s favorite dish. Finally, around Erfurt there is a scrumptious meat dish called Thüringer Rost Brätel. For this you take thick pieces of boneless pork and marinate them for at least 24 hours in a mustard-onion sauce with a little beer, garlic, salt, and pepper. Then grill the chops over hot coals—delicious! liquid. Then add in the chunky potatoes, a couple of teaspoons of Dijon mustard, a bit of oil, some chopped red onion, and sliced French cornichon pickles. 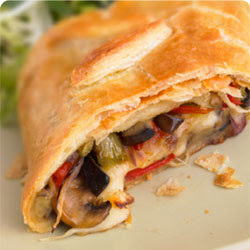 It becomes very creamy and tasty and has no calorie-filled mayonnaise in it! Germans are also big on noodle dishes. One finds Späztle (a small pasta) and Maultauschen (a type of meat and spinach ravioli) in southern areas of the country; in Thüringia there are the strange-looking, but tasty Klöße. 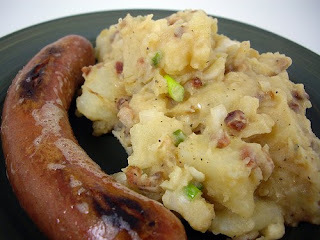 The latter are snowball-sized potato dumplings with croutons inside, which are great for sopping up gravy. The Swiss grated potato pancake, rösti, which is similar to hashbrowns, is found on many menus as well. 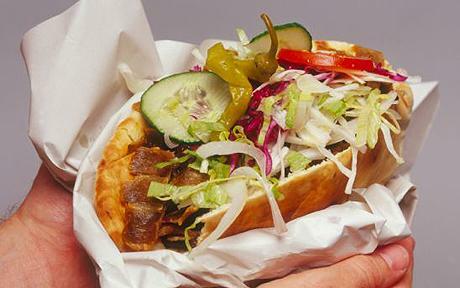 Last but not least in this quick overview of common German food items, is the Döner kebab. Because of the prevalence of many Turkish immigrants, small Döner places dot the German food landscape especially in large cities. Similar to the Greek gyro, this terrific sandwich usually consists of roasted lamb inside pita bread topped with lettuce, tomatoes, and onions. Supposedly the addition of pita was developed by a Turkish immigrant to Germany who thought, correctly, that it would be more easily portable that way. It is quite delicious and costs about three euros. out a lot. 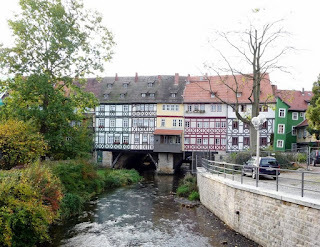 How they use many fresh herbs in their cooking, how we had a delicious steak and German red wine at Alte Meister in Dresden, how the Gemüsestrudel (vegetable strudel) at Zum Goldenen Schwan in Erfurt was worth going back twice for! There’s so much to discover and enjoy in German cooking! Next week we'll take a look at their beer and wine. municipality of around 200,000 inhabitants has evidence of human settlement dating from prehistoric times. Erfurt was the scene of many important facets of recorded history as well. 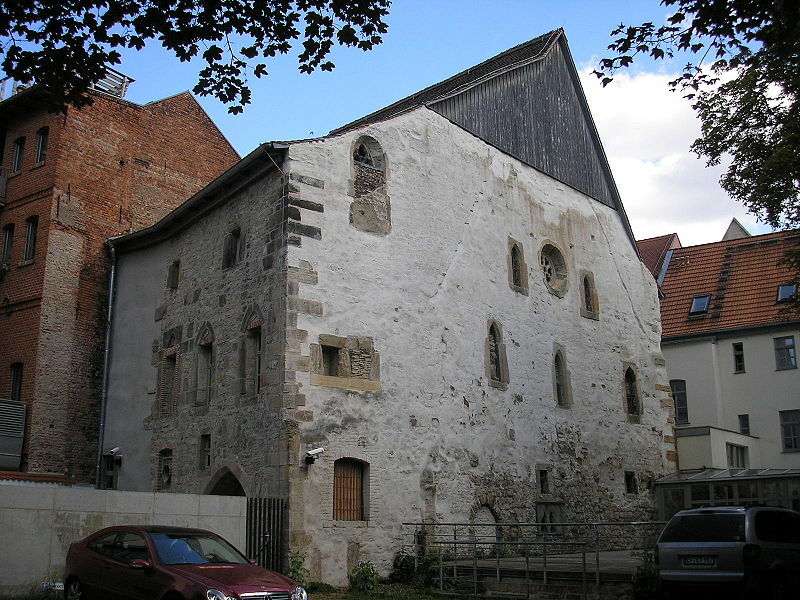 The city witnessed the Black Death and subsequent pogroms against Jews in the fourteenth century; Martin Luther went to the university there; Johann Sebastian Bach’s father was born in Erfurt, as was sociologist Max Weber; the city was bombed during World War II, but not as extensively as other places, allowing it to have a preserved medieval city center. Under the Soviet dominion after the war, not much was done to rehabilitate East Germany. But beginning in the latter part of the twentieth century, because of taxes placed on West Germans, funds were provided to rebuild the East, including Erfurt. The result is a lovely, charming town, well worth a visit. East Germany, in general, impresses and surprises modern-day tourists by its bustling economy. Downtown areas in all of the cities we visited have multi-leveled malls packed with shoppers. 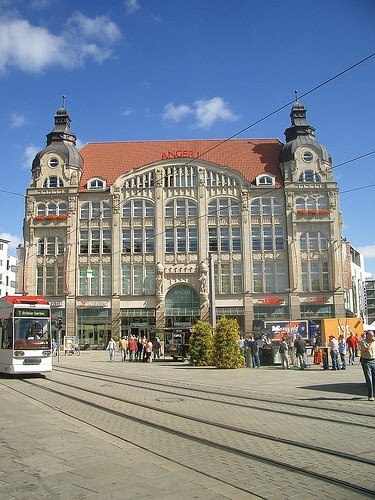 Restorers of Erfurt wisely took an old building on Angerplatz in the heart of town and fashioned it into a contemporary shopping center. In fact, from the outside you would never guess what lies within the beautiful Jugendstil (Art Nouveau) structure on the city’s main square. Buyers can purchase everything from fruits and vegetables to clothing in the six-story mall. Bridge"). Walking across it, one has no idea that it is a bridge because 32 timbered, inhabited buildings line both sides. The original wooden span over the Gera River dated from 1117, but because of fires through the years, it was rebuilt many times. The current stone structure was finished in 1472 and presently has special preservation status in the country because of its historical importance. At the Domplatz one finds a large square surrounded by shops and restaurants which often holds fruit and vegetable stalls alongside wurst vendors. Up the hill one finds two churches: Severikirche (St. Severus Church) and the Mariendom (the Cathedral of Mary). These unique places of worship which sit side by side are examples of the German gothic style. 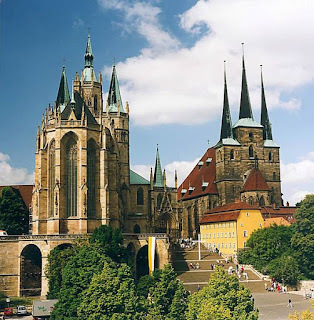 The Erfurt Cathedral is especially striking with its wooden carved choir and its stunning windows which are over 40 feet high and are considered among the greatest of medieval stained glass works. the year 1100, it is thought to be the oldest Jewish house of worship in Europe. Although the exterior is remarkably well-preserved, the interior still requires restoration. Besides all of the sights in Erfurt, there is the surrounding Thüringer Wald, the regional forest, whose Gold Trail is a paradise for hikers. There are also culinary specialties, but I’ll have to save that for next time. inquired at the Dresden opera house in June about the possibility of such a visit and were told to come back at three o’clock that day. We were unprepared, however, for the number and different nationalities of people wanting the English tour: not just British, Australians, and Americans, but a wide variety of non-German speakers from French and Japanese to Eastern Europeans. 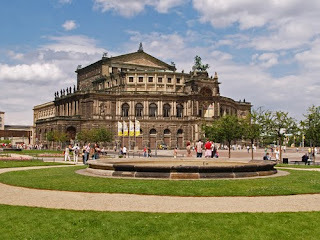 The Semperoper is an opera house, a theater for plays and ballets, and a concert hall; its history, like that of many other city monuments, has seen its share of misfortune. 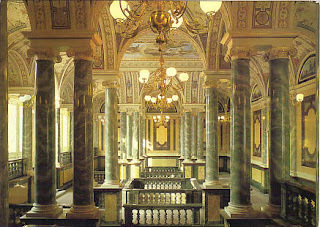 The original structure, designed by architect and professor Gottfried Semper, was built between 1838 and 1841. Then referred to as the Hofoper [or the Royal Opera House], the building was the sight of many premieres, including Wagner’s opera Rienzi in 1842. 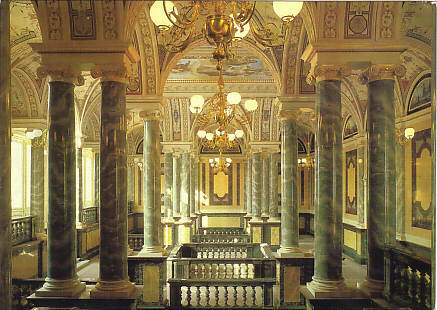 The first tragedy to strike the edifice was a devastating fire in 1869. 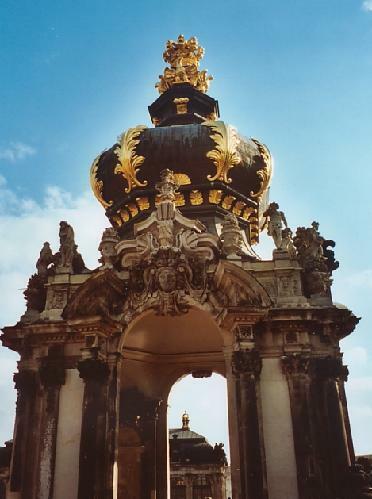 Semper, although exiled because of his part in a democratic uprising, was again asked to be in charge of the rebuilding; his son Manfred oversaw the on-site reconstruction which was completed in 1878. During that period, the exterior was changed to the neo-Renaissance style, while the interior reflected the popular art nouveau. hurdles facing the rebuilders was the absence of both architectural plans of the exterior and photos of the interior as it was in 1841. What did remain were hundreds of letters from Semper to his son concerning the reconstruction after the fire. It took over thirty years to begin and eight years to rebuild, but the Semperoper regained its former glory in 1985.
putting plaster over brick to create each column—over three hundred hours for each one. 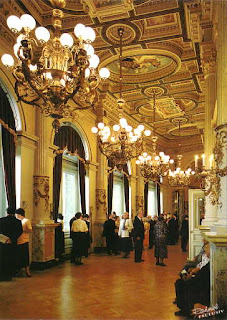 The chandeliers throughout the building had been melted down for scrap metal during the post-war period. As was the case for the doors of the Frauenkirche, a call went out for photos of the lights which once hung on the three floors. Finally, our group went into the auditorium which, except for certain modern modifications, has been meticulously restored. 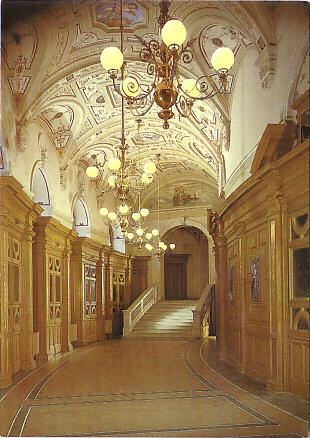 A plan was found in the Semper archives in Zurich in order to recreate the 1300-piece great chandelier. The opera house now employs over 800 people, including 150 musicians and 100 singers. 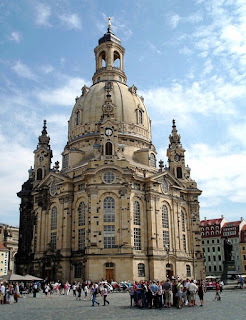 It is a testament to the German people that they even conceived of rebuilding Dresden. The city gives evidence to both the artistry of humankind and the horrors of war. 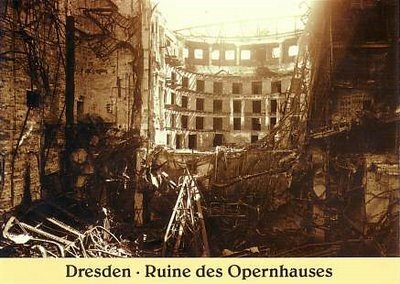 In the minds of many, the name Dresden recalls only the carpet-bombing which occurred on consecutive days in February 1945. 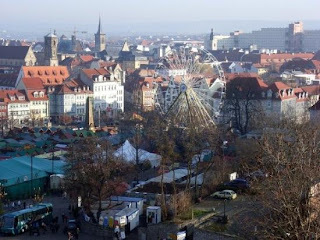 Until that point in World War II, the capital of Saxony was the only major German city which had been spared serious damage. As a result of the war-time attacks, however, fifteen square miles of the downtown were nearly completely destroyed, a fact that remains controversial to the present day. For Dresden was considered Germany’s answer to Italy’s Florence: that is, a center of art, music, and science; it was the “Jewel Box” of Saxon royals for centuries. 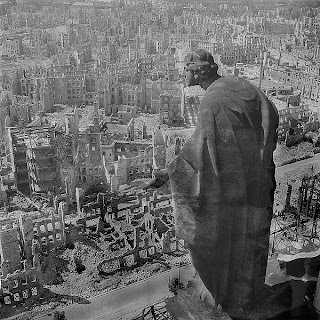 The good side to this story is that, in the decades since the war, the people of Dresden wanted the city rebuilt to reflect its former glory. And that has, in large part, come to pass. Lutheran Church of Our Lady. The ruins of the church remained as an anti-war memorial for decades. 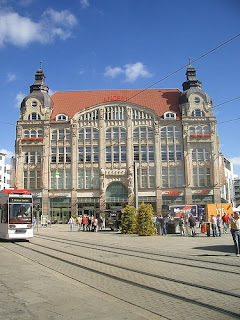 But at the end of the 20th century, contributions poured in from around the world, allowing this and other buildings on Neumarkt (New Market Square) to be restored. More than 3800 original stones from the church were replaced exactly where they once were, a feat which required the original plans of the church as well as modern computer imaging software; the older stones, blackened from the firestorm, stand out against the lighter-colored new ones. The church’s oak doors were recreated after an appeal went out for old pictures from the general populace. Two thousand pieces from the original altar were also incorporated inside the church, whose baroque interior has now been completely redone. 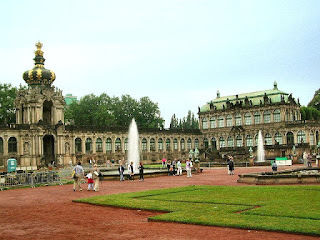 bombardment, the Zwinger was reconstructed during the 1950s and 60s. It is a treasure trove of architecture: the Kronentor (Crown Gate), the Nymphenbad (Nymphs’ Bath), plus many detailed scuptural decorations, such as friezes of Bacchus and Pan which adorn the walls. 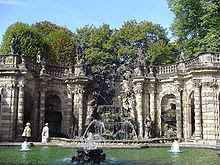 There are also fountains, gardens, and porcelain and art collections on the property. 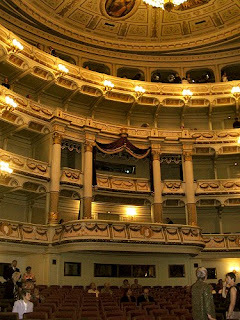 There is so much to say about Dresden; I'll save our visit to the Semper Opera House for next week's posting. Auf Wiedersehen!